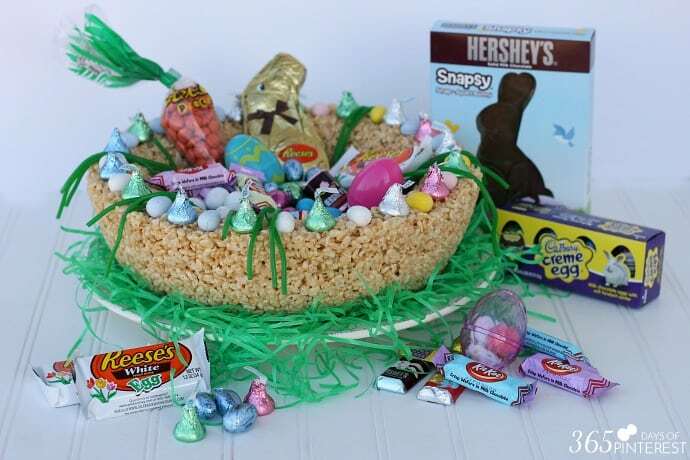 This year, celebrate Easter with a unique edible Easter basket stuffed full of #HersheysEaster candy! Sunny days, green grass, blooming flowers…everything about spring is a celebration! When I was a little girl, I celebrated Easter wearing a brand new frilly dress, a white hat and shiny new white shoes that hadn’t been scuffed up yet. 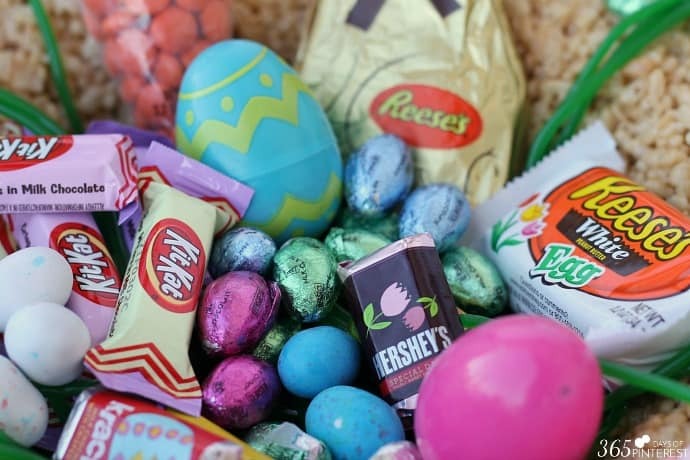 We would wake up on Easter morning and find baskets stuffed with candy on the table and then run around the house searching for Hershey’s Chocolate Eggs under pillows and behind books on the shelf. It was always a contest to see who would find the most. 😉 For my boys, I decided a few years ago to consolidate to one larger basket since all the candy eventually gets shared anyway. This year, I took it up a notch and created an edible Easter basket! 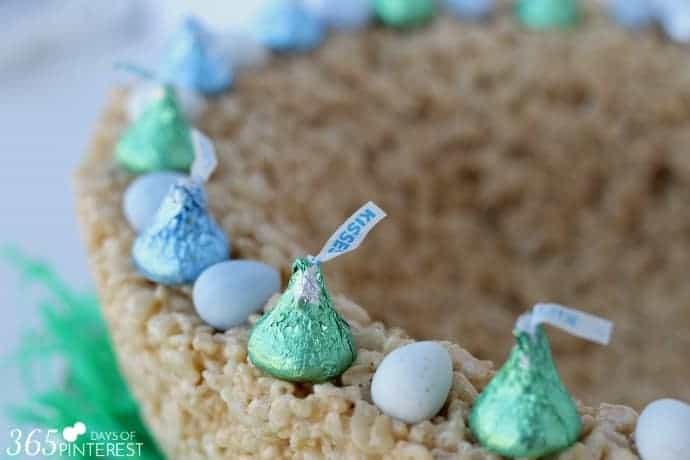 Marshmallow crispy treats are one of my favorite treats and perfect for molding into fun shapes like pumpkins, basketballs or Easter baskets! In a large saucepan over low heat, melt the butter and marshmallows, stirring together until smooth. Remove from heat and add the cereal, stirring until well-coated. Grease the bowl with butter and then add the mixture to the bowl while still warm. Grease your hands with butter and then press into the bottom and up the sides of the bowl. 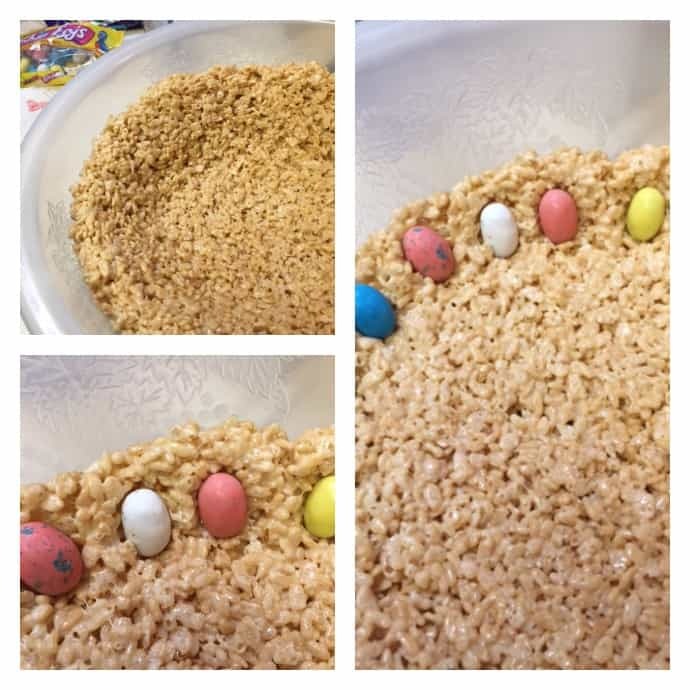 If you choose to stuff with the candy eggs, add half of the mixture to the bowl, press the eggs into the sides and then cover up with the rest of the mixture. After the bowl is shaped evenly, add chocolates around the edges for a finishing touch! NOTE: if you don’t have a large enough pan or have difficulty stirring such a large batch, simply divide the recipe into half or thirds and do a little bit at a time. Now comes the best part: filling this delicious basket with even more delicious chocolates and candies for a special Easter treat! Daddy has already laid claim to the Reese’s Pieces “carrot” and Mommy is claiming the Cadbury Crème Eggs. The boys will enjoy the rest. OK, maybe I’ll sneak a Reese’s Peanut Butter Egg here and there. 😉 Even the “grass” in my basket was edible! Charlie keeps calling them “tweezers” but they really mean Twizzlers Green Apple Easter Grass Candy. 🙂 All of these goodies are available at retailers nationwide, so hop (see what I did there?) over to your favorite store and load up! 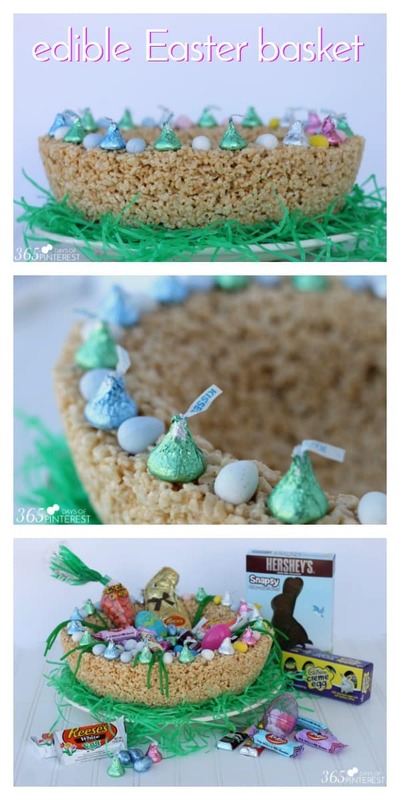 Head over to Celebrate with Hershey’s to read more Easter crafts and treats! Love this edible Easter basket? Pin it for next year! That is a darling presentation! Oh, that is a really cute idea. That would look great sitting in the center of the dessert table too! 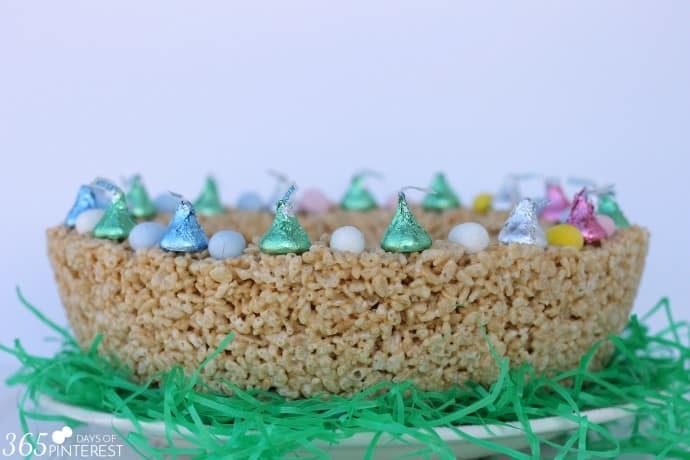 This would be a cute centerpiece for Easter too…then dessert! What a great dessert, centerpiece or gift idea! That is such an awesome idea! I think I am going to have to try this. Love it all! What a great idea to making an edible basket too. What a fun idea! This is super cute. My kids would like it. That is my perfect kind of basket LOL! 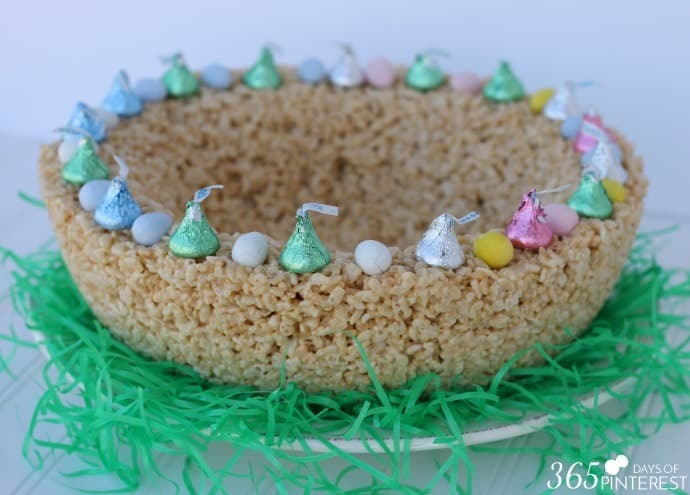 What a great idea using crispy rice cereal to create the basket!!! !